Left to right, front Clyde Chivens and Joseph Nunn. Harry Boller is at the rear of the mount. Boller & Chivens manufactured twelve Baker Nunn Schmidt optical camera telescopes for Smithsonian Astrophysical Observatory . The optical design included a 20-inch, three element corrector lens assembly projecting to a 30” diameter, f/0.75 primary mirror reflecting back to glass aspheric focal plane surface. 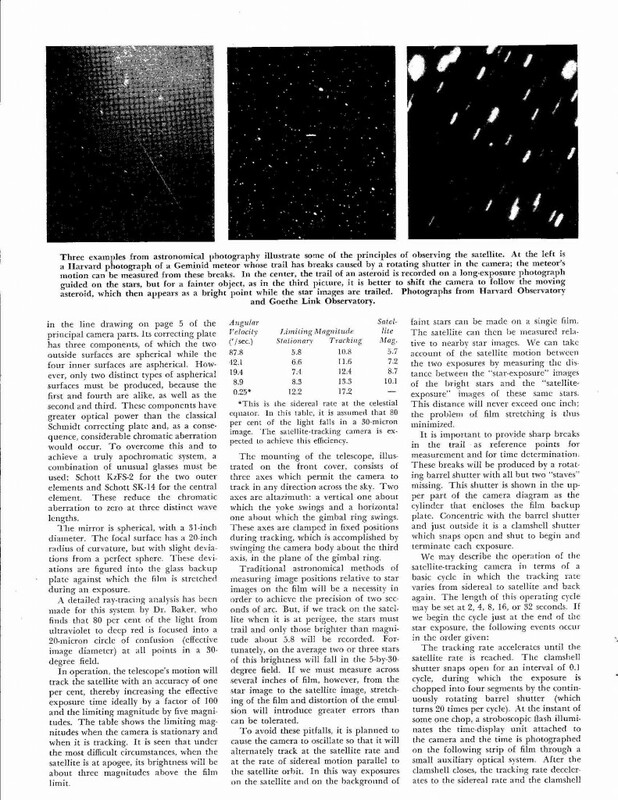 Ten inches of 55 mm wide cinemascope film was stretched over the focal plane surface for tracking artificial satellites. 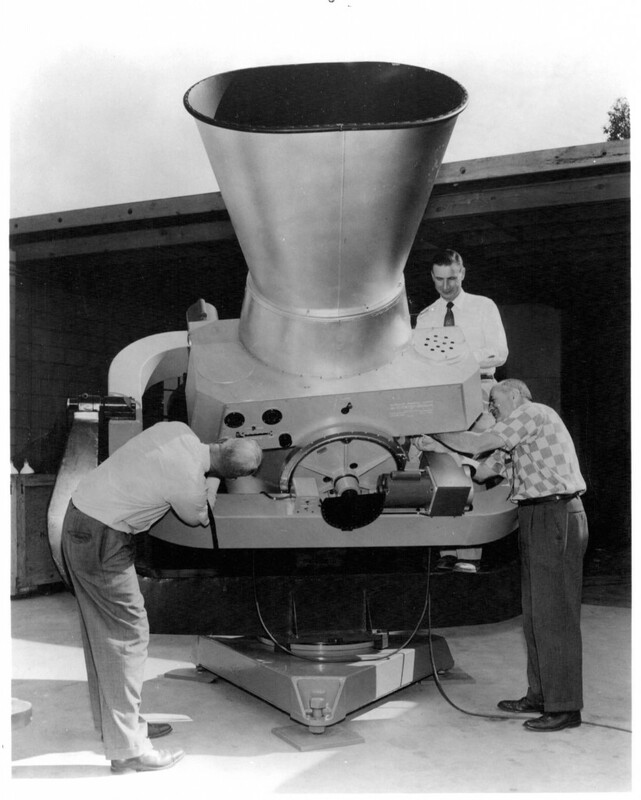 The first deliverable Baker-Nunn camera In the foreground, Karl Heinz, the principle investigator for Smithsonian’s part in Satellite Tracking program. Audrey Stinett is in front of the Norman Time Standard clock. 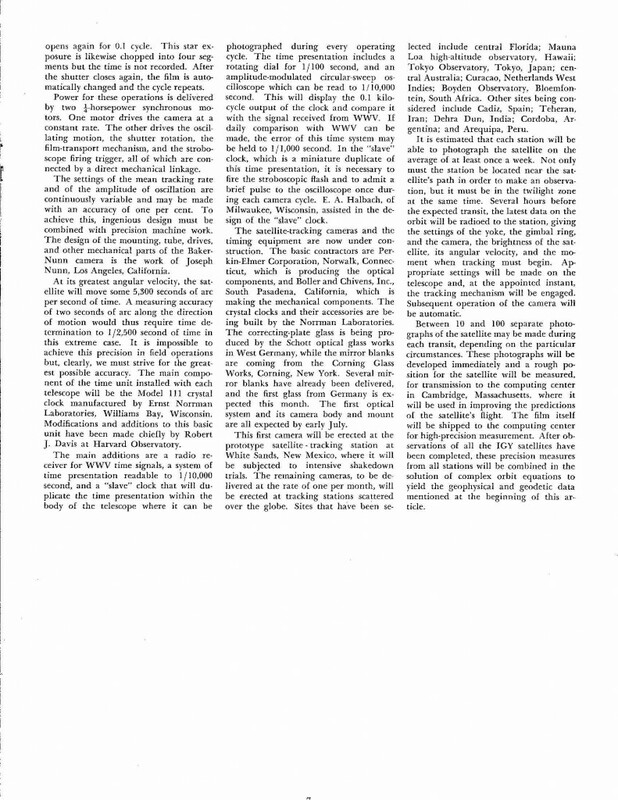 Clockwise, Audrey Stinnet, Smithsonian station personnel training leader. Joe Nunn kneeling on camera support ring. Frank Shaffer, B&C program manager and Clyde Chivens, at front of camera. The Baker Nunn Cameras are designed to have a triangular base. Mounted on the base is a fork rotating 360 degrees. A gimbal ring is mounted to the fork tines that could rotate plus or minus 80 degrees in elevation. 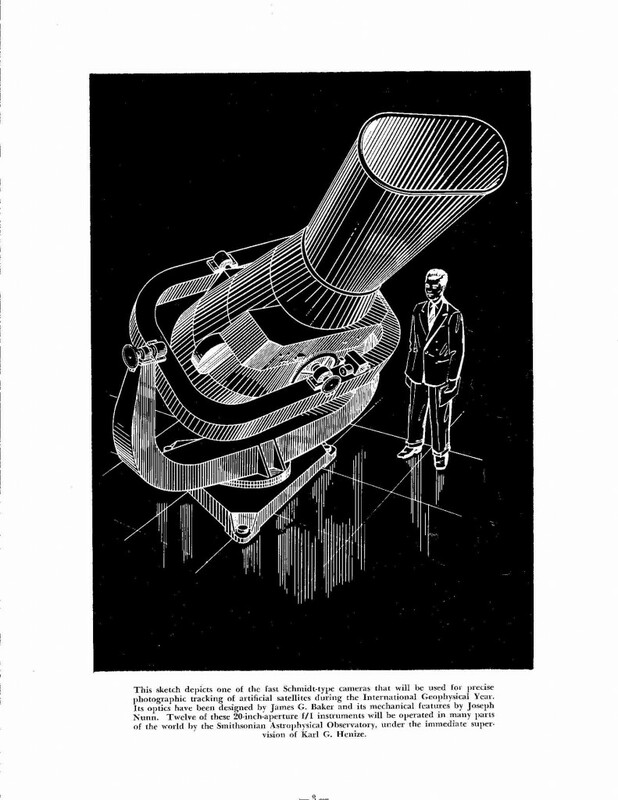 Mounted on the center of the gimbal ring was the Optical Camera assembly. The camera assembly can be motor driven plus or minus 70 degrees in a 2nd elevation axis that is 90 degree to the 1st elevation axis. 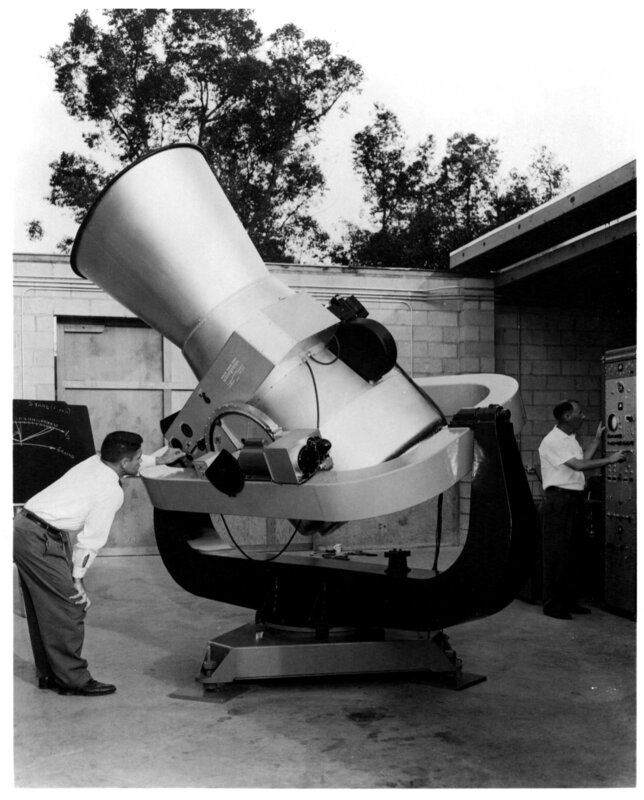 The total moving mount is balanced such the it can be positioned to track across any angular direction in the sky. 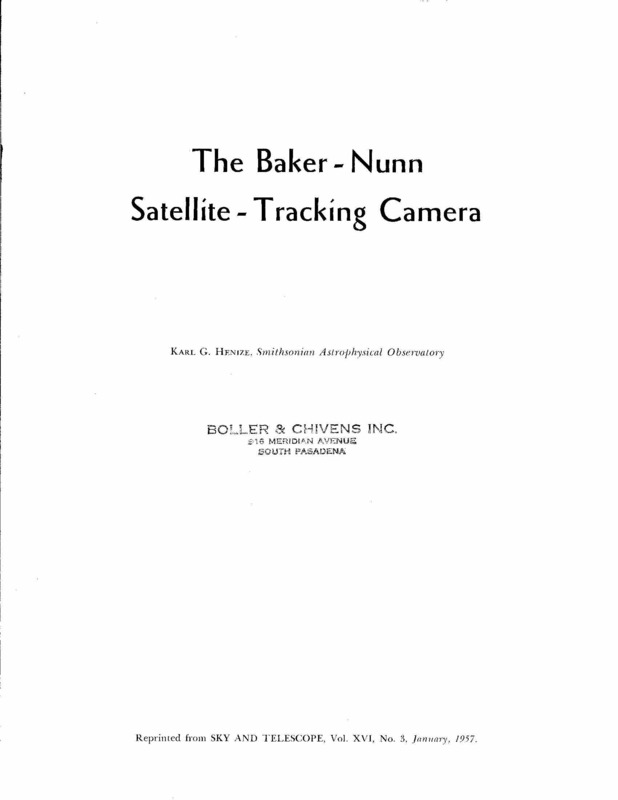 The Baker Nunn Satellite Tracking Cameras consists of a three-element 20-inch entrance aperture corrector lens system. The corrected image is projected down to a 31-inch f/1 spherical primary mirror. The focusing converging image is then reflected back up to an optical shaped focusing surfaced back-up plate where the film exposures are made. The Satellite Tracking Cameras consists of a continuous 35-mm length of film coming from a supply canister. The film is stopped for an exposure at the center of the film bridge and is then stretched over the optical shaped surface on a backup plate. The stretching of the film will place the emulsion surface of the film in focus over the total width and length of the films exposure. 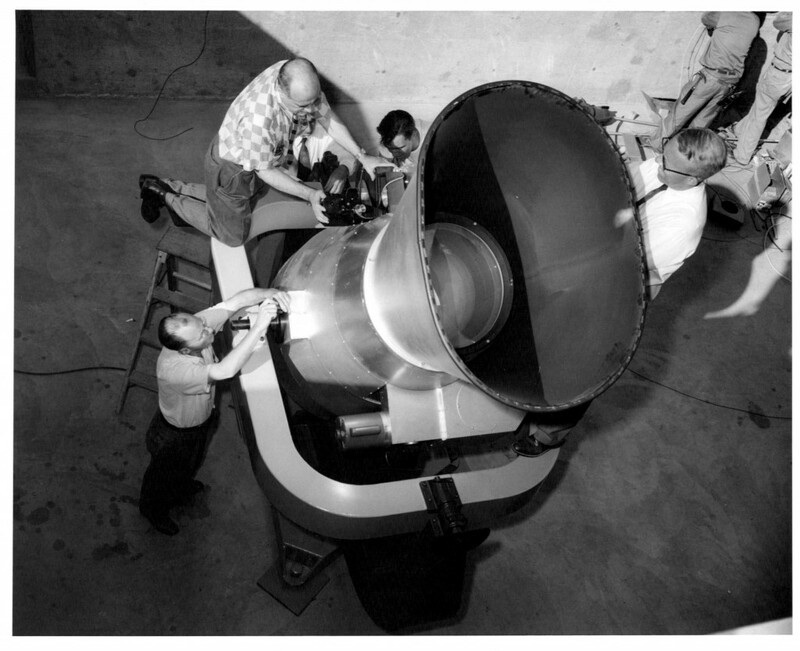 The film is then transported out to a take-up canister stopping with its trailing length ready for the next exposure. Continuously, a pair of rotating shutter blades is passing around the film bridge, which will create clear stripes in the exposed image trail of the traveling satellite photo. 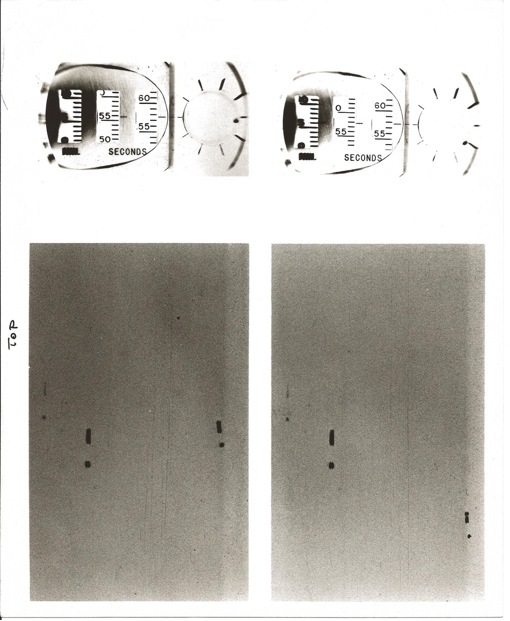 Continuously, another complete shutter is opening and closing, blocking unwanted exposure during the film transport. A selectable speed worm and gear drive will drive the camera assembly tracking a satellite passing overhead. Selectable transporting speeds can be implemented for tracking different satellite transit speeds. Simultaneously an International time signal clock from the Norman Clock Co, Green Bay, Wisconsin is located at each Baker Nunn Satellite Tracking station. A time signal will be projected on the end of each exposure of the film. 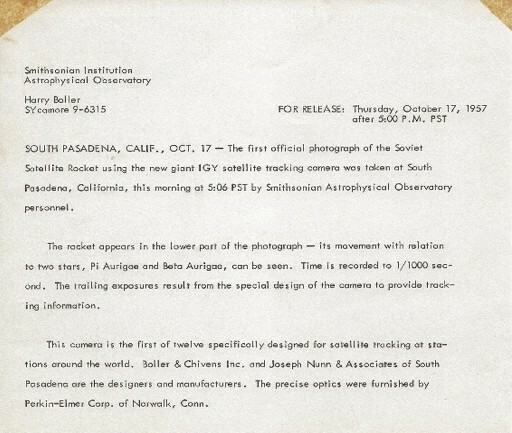 The first photos taken of “Sputnik”, the Soviet Satellite Rocket, with the first of twelve Baker Nunn STRAC satellite tracking cameras as it passed over Boller and Chivens’ assembly building on October 17, 1957. 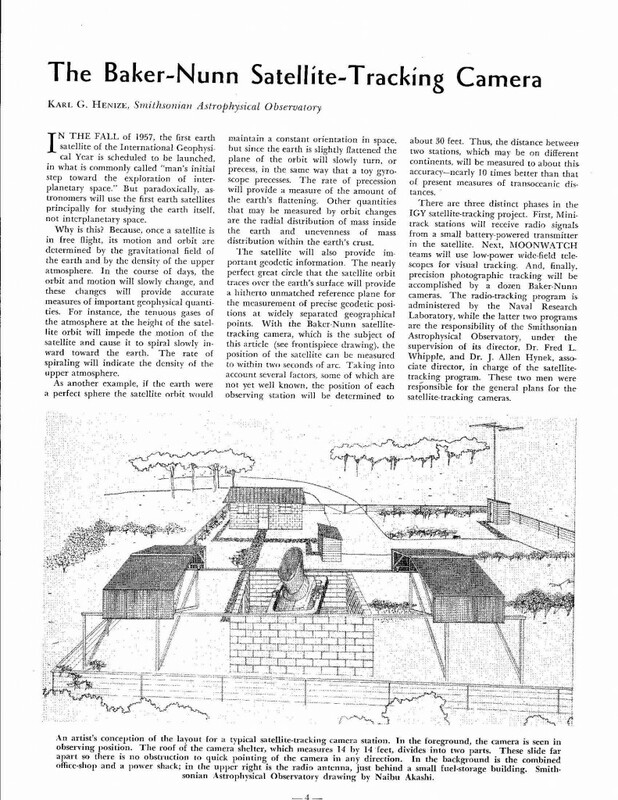 Click here for additional information about Sputnik and this project. Hello. 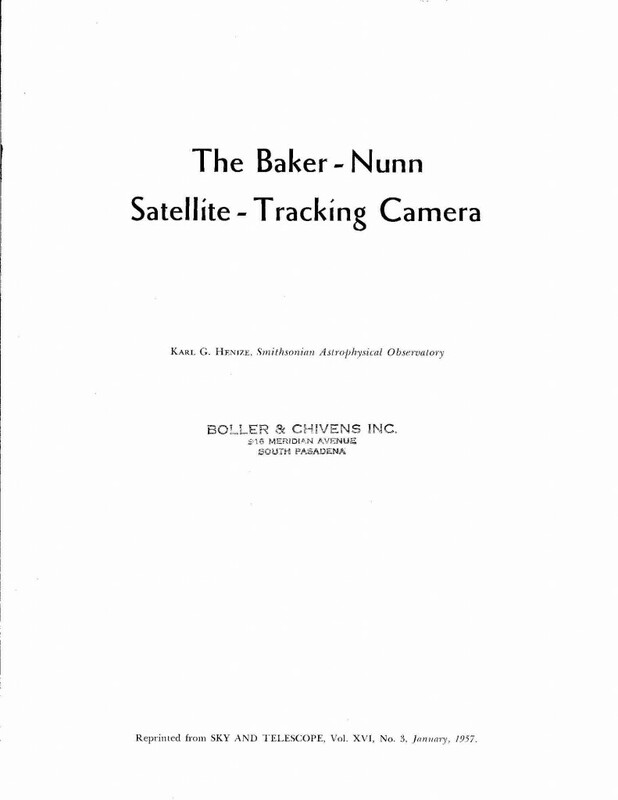 I worked with the Baker-Nunn Camera as an “observer” for the Smithsonian Astrophysical Observatory Satellite Tracking Stations in Jupiter, Florida; Natal, Brazil; and Woomera, Australia. A wonderful camera, but a real bear to repair when something went wrong – usually because an “observer” made a nasty error! David. Your second photo caption refers to Karl Heinz. This is in fact Karl Henize. I am glad to see that these marvelous telescopes are being upgraded to use CCD displays. Of the 12 telescopes, does anyone know how many are still in use? 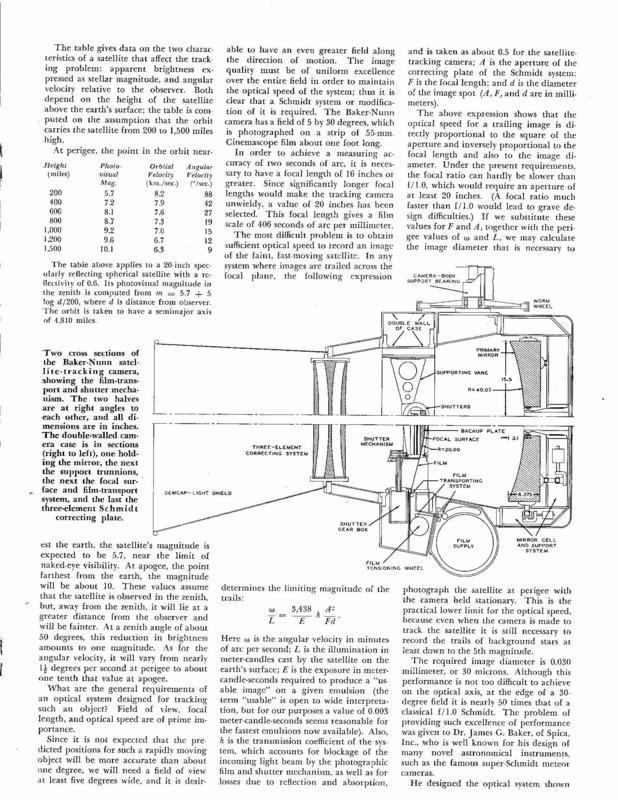 I remember holding up a model of the telescope in our backyard to a group of astronomers.